I am from Italy, the city of Genova nestled in the flower Riviera caressed by the Mediterranean sea. One of my fondest memories as a child, is the white daisies I picked on the hills, bunched together with blades of grass, the vibrant colors, the fragrance of the blossoms. My first hand tied flower bouquet. For my Mamma. I moved to USA in 1978 and to Florida in 1986. My marriage to Ikebana Designer Keiko Nakamura brought me to Japan. ( to meet the in laws). Over there I did not discover just Kirin, but also a quaint dried flower shop in a Dutch village attraction. Flowers could be preserved. Upon our return to Florida, experiments begun with drying our own flowers and foliage. We became enamored with the creative process and the long lasting permanence of the flowers and we started: "Flower Dreams"
We opened retail locations in Dadeland mall, 163rd street, Aventura, West Palm Beach Malls and participated at art and craft shows. Then we turned into the wholesale field manufacturing dried floral bouquets, wreaths,decorative hats and baskets. Exhibited at the Atlanta, Las Vegas, Miami, Orlando,Tampa Wholesale Gift and Decorative Accessories Shows. Among our clients: Burdines, Jordan Marsh, Jc Penney, Ritchies of Atlanta, Publix Supermarkets, Albertson's, gift stores, country stores, florists and furniture stores. I traveled to Colombia, Venezuela, Italy, and various USA cities to work and consult companies in various methods of preservation, as well as designed floral lines for the USA market. Today based in South Florida I freelance in various aspects of the fresh and permanent floral business and on the internet creating sites and lecture on the future of e-commerce. Remembering all the hardship that takes to start a business from scratch, I created this website and I am writing a guide to start your flower business drawing from my 25 years experience. Keiko studied Ikebana in her native country of Japan. She is a visionary designer with a lot of feelings. 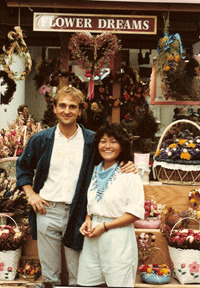 Keiko partnered with Paolo to create "Flower Dreamers" in 1986. Her creations caught the people's fancy. Soon enough they assembled a 20 people team duplicating her in demand designs. 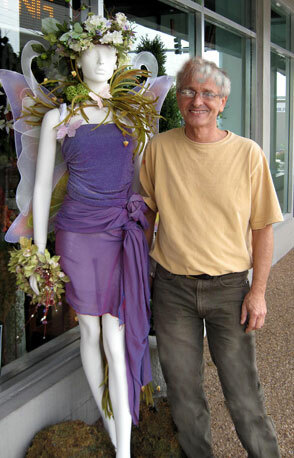 This Florida based floral business became known for quality dried flower creations. Started as a "dream" in a little apartment, Keiko talents helped Flower Dreams reach sales of $80,000 monthly in the midst 90's. A great achievement for it's humble beginning. Keiko is now back in Japan and we miss her dearly. Graduate from the Art Institute of Fort Lauderdale in 1981 with a degree in Interior Design. Worked with Walls Squire Associates, the original founder and designer of Las Olas Blvd. Employed by Collica Flowers of Las Olas Blvd. 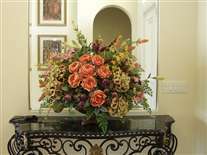 Trained by Victor Collica, one of the most well-known and innovative Fort Lauderdale floral designers. 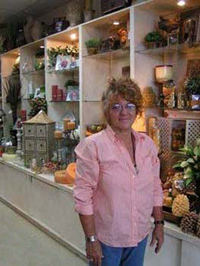 She opened and managed "From the Heart" the first dried flower's shop in Fort Lauderdale. Established "Connie" as interior design practice with floral complements. This has been 20 years old practice of commercial and residential design. From retail stores to restaurants and malls, from apartments, moderate residences, to mansions, her work can be found in numerous locations from Key West to Orlando. She has been a true inspiration through the years, and my teacher in the design path. Her philosophy can be summarized by the following statement: "To Accent The Presence of Preciousness"
Joyce is Joy's Florist, Ft Lauderdale Favorite Local Florist and the Favorite Flower Girl! She opened it after graduation from Northeast High School, back in 1973. Her business has been built on reliable service, a unique style and good feelings. For Joy a key part of being a good florist is knowing what is appropriate, what's in season, what is new and what is different. She has helped me more then anyone else to understand the life of a florist. She is also a source of inspiration through her designs. From classic to modern and one of a kind flower designs, Joy's Florist has become a destination for quality work in Fort Lauderdale. Every Long Journey, begins with a small step. Have your story featured here. Send in your story and Pics. "Accent the presence of Preciousness"